In the Prelude to the series “The Change Elements” I talked about motivation being driven either by fear or excitement, was showing alarming corporate world figures on Employee engagement and raising the question why organizations are dealing so poorly with motivating their employees based on excitement. The following short essay is dedicated to the first of three fundamental drivers I am convinced giving us the answers to this question: The right Leadership. Being aware of this model, being able to recognize development levels of your staff and knowing the right tools for further developing them, at a first glance it might seem wishful to have all people of your team or organization fully developed and mature. With no doubt is having highly developed people a valuable and aspiring goal, but in my opinion you need to make sure you do have a vital mix (in a team, a department, the whole organization) of different development stages. I´d therefore like to suggest using the model also as a tool to analyze, develop and manage an effective “staff portfolio” deliberately containing people at all maturity levels. The Situational Leadership Model differentiates between four development stages (D1 to D4), respectively four maturity levels (M1 to M4). At level 1 people are “still lacking the specific skills required for the job”, at level 4 they are “experienced at the task, and comfortable with their own ability to do it well”. People on the lower development stages (D1/D2) tend to question everything, ask a lot “Whys”, and need a lot more effort and time to be lead. (Anybody ever got to know someone like that?) While the behavior to question everything can be exhausting and inconvenient for the leader, this “Beginners Mind” can as well be seen as a “gift” for the organizations development. It´s not a coincidence that in Problem Solving methods the basic technique of “5 Whys” is taught as an easy and effective tool for discovering the root cause of a problem. The technique basically works by starting at the problem´s end result and working backward whilst continually asking „Why?“ until you end up at the root cause. Or in other words: being a p*** in the a** by not stopping asking questions until you reach the very root of the problem is vital. This “natural gift” of a Beginners mind should be extensively used by every organization. By doing so, I am convinced the leader is supporting the excitement of employees by fostering a “Beginners mind”. Why? Close your eyes for a few seconds (but wait until finishing reading this paragraph), think about watching small children play (=learn). Do you recognize the excitement and energy in their efforts all day long, even if they fail? Remember your first days in your job. Wasn´t every detail a thrill digging into, even you didn´t have a clue about what was really going on? Steve Jobs famous cite in his Stanford commencement address from 2005 emphasizes the need to keep a Beginners mind. “Stay hungry, Stay foolish” he advised the graduates. This might also be an invaluable advice for todays (mature) organizations. 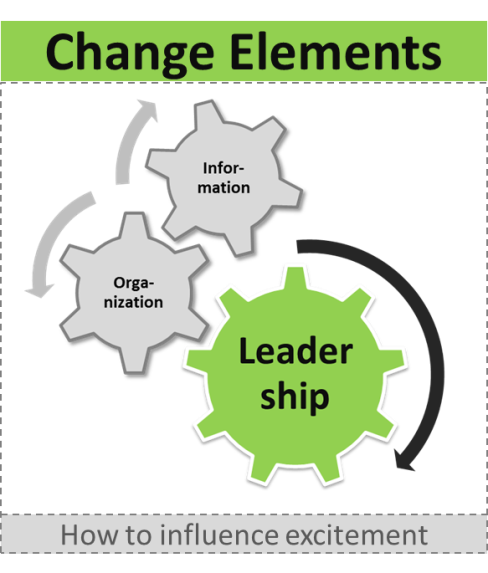 Follow me in exploring the next two elements, „The right Organization“ and “The right Information”, being released until mid of December as part of the #blog2change Initiative. Stay tuned!